Properly maintained and upgraded ships and air frames can last for many years. Very true. The submarines are the example that the surface ships are now using for material management. They are extremely well monitored and taken care of, probably because of their past issues. The current submarines are in excellent shape. They have been lightly used. Not rust. The number of dive-and-surface cycles that stresses the submarine’s hull. Very true, repetitive loading is the main issue here, like bending a paperclip back and forth (for those of you who are not aware of material issues... apologies to those who are for sounding "know it all" like). NETE is developing new testing techniques to look for internal stress cracks in the pressure hull so we don't have a Montreal idler gear type situation. Those subs are lavished with attention from a material perspective due to SUBSAFE requirements (and rightly so). Interestingly, submarines and airplanes share many similarities regarding fatigue life - many (pressurized) aircraft have their lifetime measured in ‘cycles’, which includes a complete pressurization cycle from ambient surface pressure to a specified ‘cabin otessure’ while at cruise altitude (usually 8,000 MSL for most) and a return to ambient surface pressure. The major difference being aircraft physically expand slightly during each pressurization cycle due to reduced atmospheric pressure at altitude, while submarines experience compressive pressure cycling during their dive cycles. In both cases, the repeated tensile or compressive cycling fatigues the main structure as well as fittings and external connectors, leading to the use of remaining structural life. And planes only have to deal with, as an obvious maximum, changes in pressure of one atmosphere. At 800 feet, a submarine is subjected to 25 atmosphere of pressure. That's one of the reason there is no sound really associated with the airplane body going through the cycle, while submarines' hulls and pressure fittings creak during the process - particularly during an emergency dive or surfacing. It's a noise that takes some getting use to. here’s a shipbuilding resurgence underway in Canada that’s being driven by a long-term multibillion dollar government initiative to rebuild the federal fleet of Royal Canadian Navy and the Canadian Coast Guard vessels and breathe new life into the country’s shipbuilding industry. Seaspan’s Vancouver Shipyards is an active player. “The National Shipbuilding Strategy is causing a rebirth of shipbuilding on the West Coast, simply put,” said Tim Page, Vice president of Government Relations at Seapsan Shipyards. “We have not had a backlog of work ever such as we have today, nor have we had the promise of that backlog of work because there has not been a federal, national commitment to a long-term strategic recapitalization program for our maritime forces probably since the Second World War.”Prior to the NSS, the shipyard had mostly built tugs, barges and ferries. “Currently, we have three active and concurrent and shipbuilding programs underway, which is a rarity in North American shipbuilding,” Page said. Seaspan is well into the program to produce the three fisheries science vessels, and in June it began building the first of two joint support ships. The yard is also designing, planning and procuring long-lead items for our oceanographic science vessel. Work to produce a polar icebreaker is also due to join the mix. It wasn't flying. They were conducting a pressurization test, the outflow valves were capped and it wasn't realized, and the tech misread the gauge. More scary is that aircraft was over 40 years old at the time of the mishap in *1999*. They are still flying KC-135s; granted maybe not the oldest ones. But according to https://www.airforcetimes.com/news/your-air-force/2015/11/23/grueling-pace-for-old-planes-tankers-and-their-maintainers-cant-afford-to-slow-down/ the average age was 55 years in 2005. How many pressurization cycles does that represent? Seaspan Shipyards is pleased to announce the achievement of an important milestone on the CCGS Sir John Franklin. Last week saw the successful running of the vessel’s main diesel generators. The ship will now progress into full load trials. DeWolf for Coast guard? 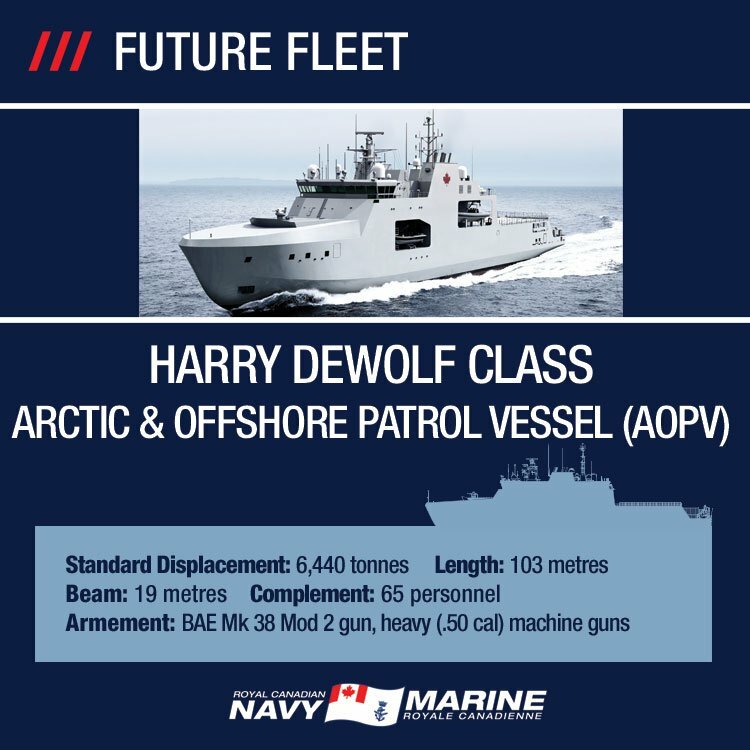 if there is a gap between construction of 5 navy DeWolf's and Type 26 construction, could that gap be filled by building 1 or 2 DeWolf's for CCG, would DeWolf's be of any use to CCG ice-breaking in St. Lawrence etc? DeWolf can operate in ice but AFAIK she would not be able to break the ice found in the St. Lawrence. Plus she can't really do buoy tending. They could be easily modified to do science work. CCG generally hates non-multi-tasked vessels. I doubt they really wanted the Hero class which is basically going back to a slightly more capable R-Class. They didn't waste time getting rid of one of the 500 class (John Jacobson) leaving one left in service (Gordon Reid). Quebec's Davie shipyard is in line to get a piece of federal contracts worth billions of dollars for maintenance on Canadian navy ships. and the Victoria's need they're life extension in another few years. Davie will again come to the forefront. Public Services and Procurement Canada announced Thursday in a news release it intends to sign contracts worth $7 billion with Davie, in Lévis, Que., Irving Shipbuilding Inc. in Halifax and Seaspan Victoria Shipyards in Victoria. The government did not provide a breakdown of how much each contract is worth. You run the re-re-started shipbuilding strategy. A protracted legal battle causes a delay in awarding the CSC contract. The shipyard will lay off hundreds unless another contract for something else is signed. The gov't of the day is eager not to lose jobs in a politically vital region, to prove itself in the shipbuilding industry, and to show the strategy is working. There is now an expected 2 year gap (don't focus on why). The shipyard cannot start to build anything for the CSC as the contract can't be awarded yet. Cabinet supports your solution to get this shipyard working asap, cost is not the biggest factor anymore (jobs/time are). You can't pre-build anything for the CSC. Nothing can be built in large numbers, as the gap is 2 years at most (unless you scrap the CSC project). Re-tooling the shipyard is not an issue (for ****s and giggles). You may change the strategy, but cannot cancel classes already being built. I'm no specialist, but since Irving is picking the pace with AOPS, why not a 7th? it might be too much to call it a "spare" one, but having 3 on each side of the country at all time might be hard, maintenance, refit, problems, the 7th could fit the gap when one is in dry dock? Contract Davies to convert another Freighter (to shut them up) and then sole source a RO RO to work as a delivery vessel for the army when required. Lease it out for commercial use with a recall provision. That way we get a supply ship capable of transporting to Europe or elsewhere, keep everyone working at Irving and keep Davie happy all at the same time and it is a resource that we don't have at all right now. There are lots of commercially available plans to ensure that no expensive re-engineering is required and it should make for a fairly quick build. Yup. “Encourage” unsolicited bids to fund ideas that address capability gaps for non CSC naval duties. Perhaps a 800 foot through deck tug boat, a peace support “ferry” and lease some “surplus” yet to be built FFG ships from the US. Commission from Irving, on a sole source contract, two (heck, maybe even three if they can squeeze it) brand spanking new HALIFAX class frigates with full "mid-life" refit upgrades already on them. Irving or the GoC already own all the rights and plans needed to do that and you would have brand new hulls ready to be the ones that will go on in a reasonable shape until they become the last ones replaced by the CSC's. Wait! Won't work. It's too logical. yep just move the builder plates to the new hull and any beams with a registry number. That would be like almost every flying Beaver out here, an old plate with new parts surrounding it. When the CSC is finally built, sell the old/new Halifax's to a 3rd world country. AOPS design will be modified for last 15 ships to include the new SG-180 upgrade that we just bought for the Halifax class, a slightly upgraded OPS room with a better DLPS (Digital Link) system and an improved armament suite to include a 40mm or 57mm deck gun (preferably 57mm with no ammo hoist - you get the 120 rounds in the mount then have to manually reload) and a set of triple Torp Tubes on each side. For ASW, they'd add the ability to mount a containerized ASW towed array system. Presto. We have a simplified fleet of 21 ships - all of the same type. It lets them throw a bunch of money at LM as a 'sympathy' response for losing the CSC to enable the redesign of the OPS room and tie in the SG-180. From the perspective of the RCN - horrible loss of capability. From the perspective of the Public - they don't know what we do anyhow, so it's a win win. That is an all too plausible scenario. Not much of a bone for LM in getting them to integrate a single new radar (for those who didn't know, SG-180 is the surface/air 2D search radar called the Sea Giraffe) into an otherwise unremarkable "combat" system. They ought to be able to do that in their sleep over the week end . NS, please stop giving the government arguments - next thing you know they'll adopt the plan and state that a serving naval officer came up with it as justification. I ain't no ossifer, I's 'just' a chief. One of the brighter lights in this thread said a long time ago (not me) that the NSPS is not a program to build ships for the Navy. It's effectively a job creation program, and the ships are a useful byproduct. Whatever ships the RCN gets will dictate the capabilities that we bring to the table...and so long as there are platforms for the MARS officers to punch their command tickets on, they'll mostly be happy. We won't even see that much loss of real capability for a long time since they'll keep the Halifax Class on as long as possible to maintain some capability. Again, it's the last thing that the Navy wants or needs - but as an evil genius plan - it's certainly do-able. And really, would the average member of Joe Public know any different? Grey ship, has RADAR on top, has gun out front - no missiles because those are too expensive, get 21 ships for less than 1/3 of the original cost, yeah, less capable, but did we really NEED those Cadillac ships anyhow? Flag gets shown overseas, we still respond to humanitarian relief missions, grey hulls built in Canada means good publicity for government, money saved goes to pay down deficit - the budget balances itself - what's the likelihood of this coming to pass...? Maybe I should write it up in a BN to the CoC as an alternate solution...? Then it goes on the corporate record instead of just as a crazy idea on the interwebz. What makes you think that Joe Public - or even the GoC - knows the difference between a commissioned officer or a Chief Petty Officer, where "naval" officers are concerned. They have no clue and don't care that they have no clue.